"Rule Britannia! Britannia rules the waves: Britons will never be slaves," are the best-known lines from a poem that was set to music in 1740. The song captures the essence of British pride, combining the strength of the nation with its pride in upholding the rights of its people. Nearly 300 years later, Great Britain continues to uphold those values with a strong military and a commitment to keeping her people free. The term "Britannia" may apply to the country or, as in the case of the coin, an allegorical figure that stands in her place. That figure stands in a gale force wind on the reverse of the coin with a shield and a trident, symbols of defense and power, respectively. That makes the coin perfect not only for those who have an affinity toward Britain but also those who share the values for which she stands. THE LATEST IN THE "BRITANNIA" SERIES – This coin is the twenty-second issue in a series that began in 1997, ten years after its gold counterpart. The reverse design has changed over time, but this edition is among several to bear Philip Nathan's original 1987 design. 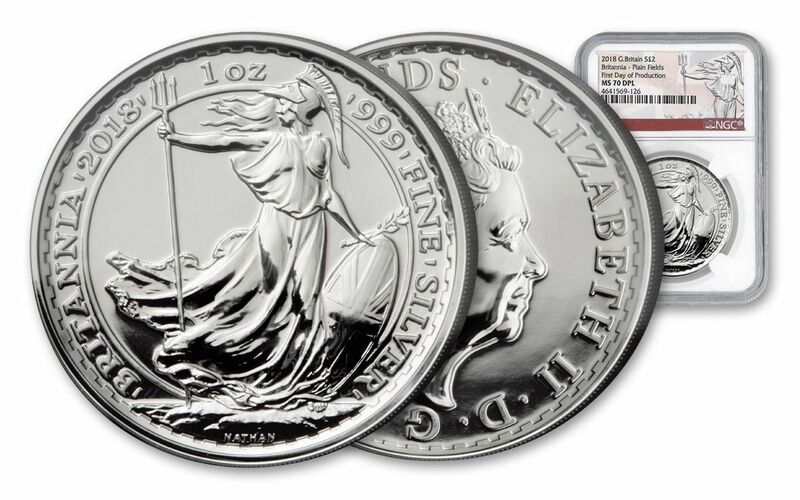 99.9 % FINE SILVER -- When the Silver Britannia coin was first issued, it was minted from 95.8% fine silver. In 2013, that changed to 99.9% fine, the standard that continues to be used today. 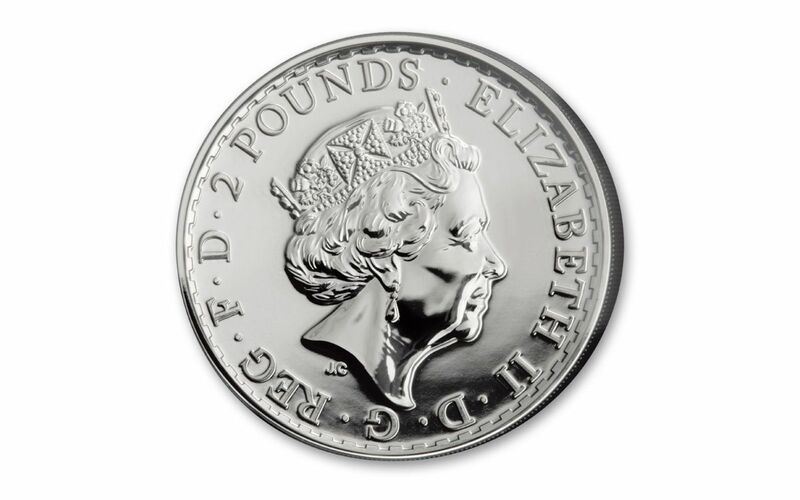 BRITISH LEGAL TENDER -- Each 2018 Silver Britannia coin is £2 legal tender in Great Britain. CERTIFIED FLAWLESS -- Your coin will be certified Mint State-70 (MS70) by Numismatic Guaranty Corporation (NGC), a distinction that means your perfectly-graded coin will have ZERO imperfections -- showing all features and fields exactly as the engraver and mint intended! 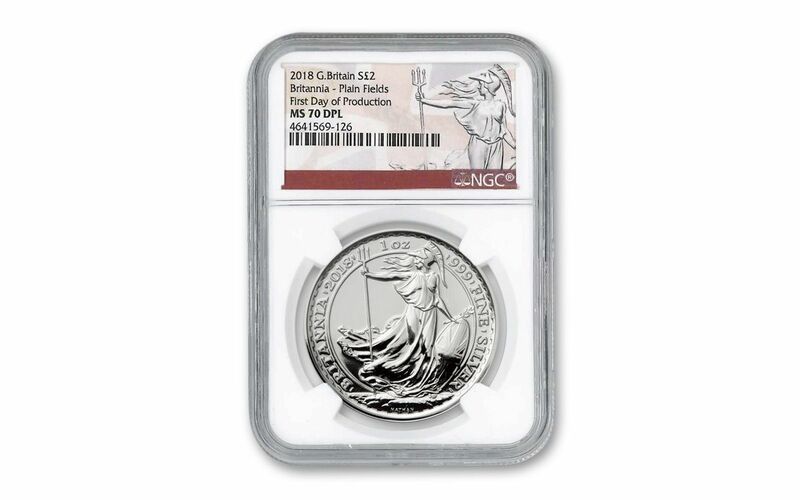 FIRST DAY OF PRODUCTION -- NGC also certified that these coins came from the First Day of Production (FDP). Coins must go through an exclusive submission process to earn such certification. Europe has a turbulent history that continues to the present. Wars, plagues, invasions, and, most recently, terrorism have contributed to a climate of uncertainty and fear. While borders have frequently changed, despots come and gone, and cultures clashed, conquered, and disappeared, for much of the past millennia, Britain has been a stalwart of stability, not only in terms of defending her shores but also leading the way in terms of upholding the rights of her people, a concept that carried over to the United States, which with Britain, has promoted the same throughout the world. 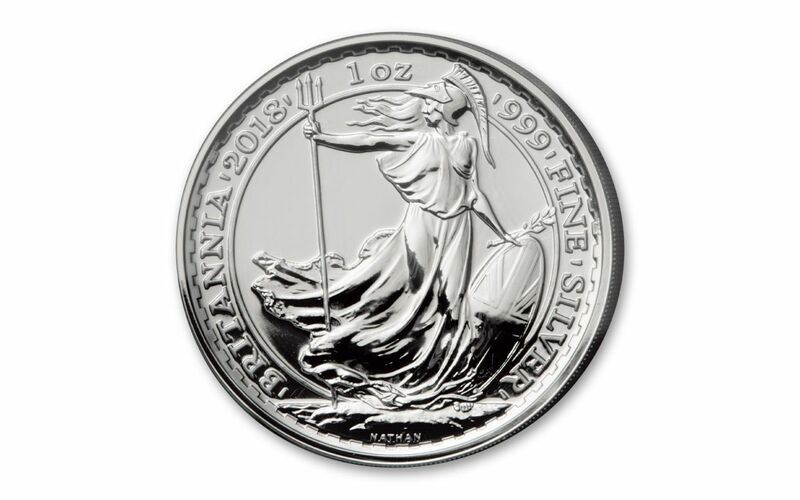 The Britannia coin in general and Philip Nathan's design in particular capture that stability and offer collectors just a small symbol of it even during challenging times. Don't miss your chance to own this remarkable coin; order now at GovMint.com.